Welcome all and happy Monday! 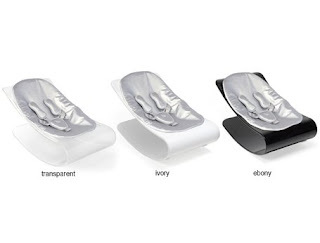 I'm going on a furniture theme this week and to start us off I thought that i would share with you one of the most stylish bits of baby gear that I have ever seen. The coco lounger from bloom is simply stunning. It comes in a whole spectrum of colours that fit seamlessly into any modern home and in two base styles. It comes in two base options, Stylewood, the cheaper of the two that comes in about £100 cheaper than the more sophisticated Plexistyle (pictured). Both base styles have a range of colour options for the seat pad - my fav being these funky little silver numbers! The Plexistyle chair is very pricey at around £200, there are plenty of deals to be found around on the net with lots of free delivery thrown in, so I suggest that you have a bit of a shop around to find the best price. It is obviously a bit of luxury as it only lasts up to around six months. If this your first baby and you are planning a brood then it isn't such a bad investment! Expect to pay around £140 for the Stylewood.